It’s been a few days since I finished Every Heart a Doorway . I can’t help but still think about it. It’s one of those stories that just sticks with you, makes you think. It’s about a girl named Nancy who disappeared into another world, an underworld most likely. Her parents, who don’t really know what happened other than that Nancy disappeared, send her away to school. Nancy’s new school isn’t what she’d expected. After being dropped off (rather unceremoniously), Nancy realizes her schoolmates are all like her: children sent off to fairylands and underworlds and magical places only to be sent back to their homes where no one can understand them. The story is just so sad, in a good way. It’s all about being left behind, not fitting in, and wanting, wanting something that you know you’ll never get so badly your heart breaks. Each student had at one point found a world where they belonged. The worlds range the gambit from “high logic” to “high nonsense” and “wicked” to “virtuous.” All of the students describe their trips into these worlds as having gone home for the first time. Being there comes with a sense of utter belonging. This would be fine by itself, but McGuire echoes the loss in the setting she creates. The school is whimsical and filled with mystery, but that all falls a bit flat. Despite free reign of the grounds and rooms chock full of color, the students can’t seem to recover, and neither do we. From the very beginning, the students make it clear: they will almost certainly never go back, and hope, while all they may have, is more painful than the despair that follows. In a way, reading the story is eerie. But, what surprised me most was how much it fit. How could Wendy really go back after Neverland? Could Lucy and Edmond really approach the “real” world the same way after Narnia? It was the fairytale ending I was wanting. The children are all a mess. They’re too old for their bodies, fixated on what they’ve lost, and lonely, even among the only people who can really understand them. Each one of them gets their own backstory and personality. Even the crueler among them is humanized, shown to be a bit broken. That’s part of what makes the story painful. The setting is humorous in its own way. The teachers are all former student, the kids have to go to group therapy, rumors and gossip abound. There’s no escape from cliques even in fairyland exile. The plot also has some action. While it can seem a slow build, tragedy strikes. Murder and mystery descend. Nancy, of course, is suspect, being from an underworld and the newest student. The action itself leads to heartbreak. It has a bittersweetness that it adds to the story. At the end, I felt that I knew the characters, like I’d bonded with them and felt their hopes and dreams. Hats off to you, Ms. McGuire. Every Heart a Doorway will be out April 5th 2016. I received a copy of Every Heart a Doorway for free in exchange for an honest review. 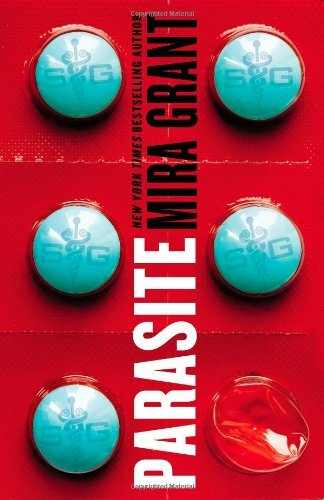 This entry was posted in Reviews and tagged Boarding Schools, book reviews, Fairies, Fairytale Retellings, Fantasy, magic, Mira Grant, Novellas, Seanan McGuire, tor.com, underworld. So, I haven’t done much today. I was going to go to the library. I want to pick up an audio copy of Coraline by Neil Gaiman. It’s about three hours long and perfect for chores around the house. I went to Half Price Books and picked up a copy of the final two books in Mira Grant’s (Seanan McGuire) Newsflesh series. I also am starting Pretty Deadly, a graphic novel published by Image Comics. I haven’t read hardly anything today and will do better tomorrow. Do you ever have a problem starting read-a-thons? This entry was posted in Bout of Books and tagged Books, Bout of Books, Coraline, Gaiman, Image, literature, Mira Grant, Updates.